Solo traveling is a gift. The voyage of self-discovery, overcoming fears, and cultivating independence are benefits that I hoped I would experience. What I didn’t expect was that the interaction with local people would make the most profound impact on me, challenging me to embrace love in a different way than I’m used to, in the form of fleeting but impactful moments of generosity from perfect strangers. At times it does get lonely striking off into the world solo, but then I realize that I’m surrounded by support in my everyday encounters. My life overflows with these little bits of perfection, given to me by the grace and kindness of others because they want to be a good host, don’t understand why a girl is wandering by herself and feel she needs to be taken care of, or they have genuinely never met an American girl before and are curious. Before the time of photography, it used to be that the highest esteemed painters were the ones who did portraiture and historical paintings. In the hierarchy of genres, landscape painting was near the bottom. Today I feel the same is true – photographing people is difficult business. First you have to ask and be prepared for a, “no,” then you have to somehow capture their essence in a single frame. 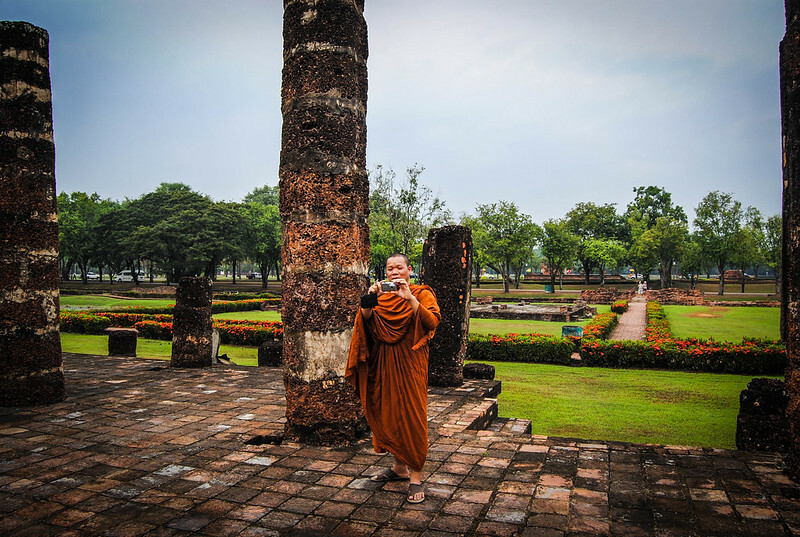 While exploring the ancient capital of Suhkothai, Thailand, I saw this monk taking a photo of me and quickly snapped a photo right back of him. I was so surprised he actually wanted to get a picture of me when I was so sure that he was the most interesting one between the two of us, but I guess that sort of thing is in the eye of the beholder. Just afterwards we took a photo together, smiling at the camera. This was the first portrait I took during my travels that began almost three years ago, and it came about in the most curious of ways. 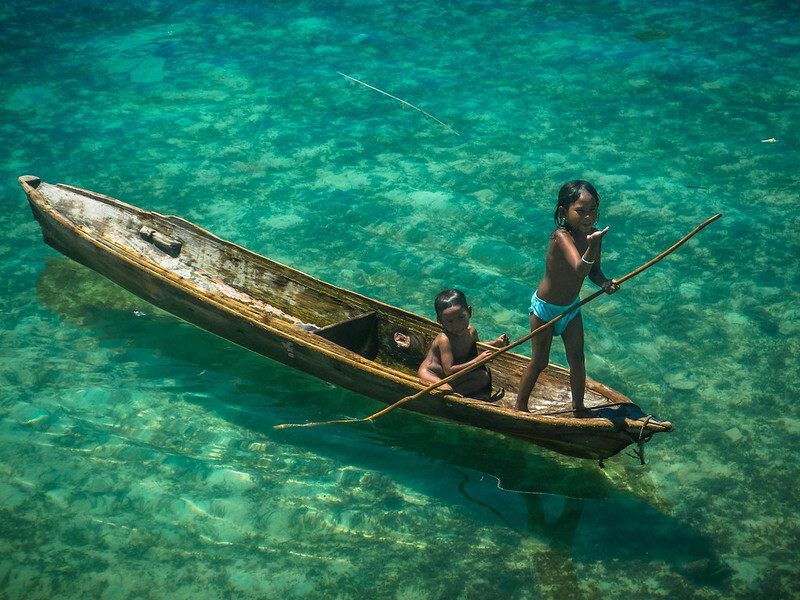 These kids belong to the Bajau tribe, also known as sea gypsies, who live their lives on the water just off of the island of Mabul in Malaysian Borneo. I had the pleasure of seeing them when I SCUBA dived in Sipadan, sleeping, cooking, and living almost entirely on boats. Some of these guys can free dive 20 meters down to go fishing, and their underwater eyesight is thought to be better than your typical human. Their profound connection to the ocean is something I can really respect, given how much I love to spend my time in and near it as well. One of the most interesting places I visited during my 2013 travels was the Maldives, not because it’s a beautiful island nation that’s famous for its resorts and white sand beaches, but because I went off the typical tourist trail and stayed with a family there. 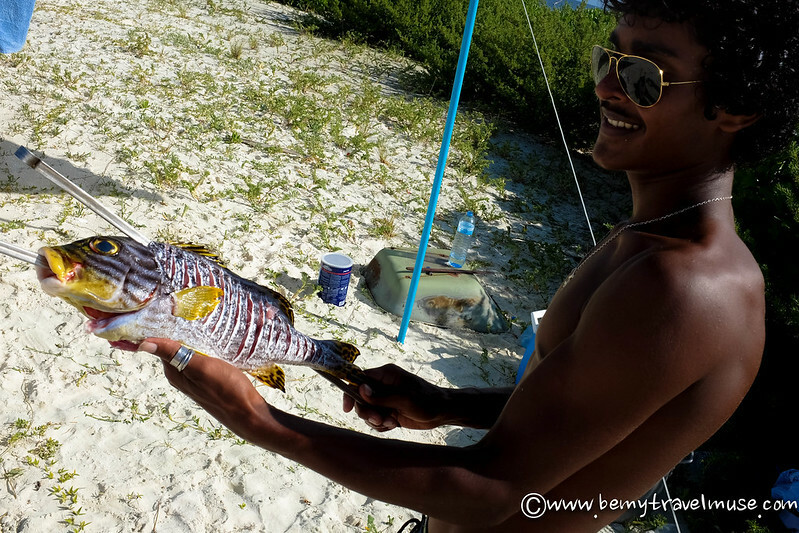 This photo perfectly depicts what the experience was like – spear fishing and then BBQing with the family right on the beach. Pictured here is one of the brothers with a sweet lips fish. 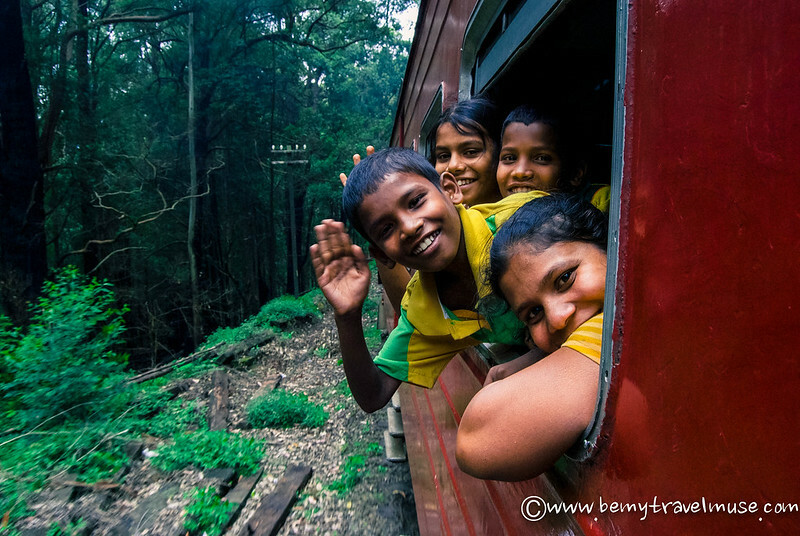 The train in Sri Lanka was one of the most beautiful and rich with cultural interaction of all of my experiences in the country. The people on the train were incredibly friendly and curious about the foreign girl in second class, with them. I loved this family in particular who smiled and waved every time the train turned, allowing them to face me as I stood in the door frame, hanging out over the rice paddies and tea plantations. It had been a lonely Christmas Eve in Camiguin, Mindanao, mainly for two reasons: tourists are told to stay away from Mindanao due to terrorist activity in the west, and because the Philippines had recently been hit by a hurricane. I saw no reason why either one should stop me from visiting Camiguin, unaffected by both situations. 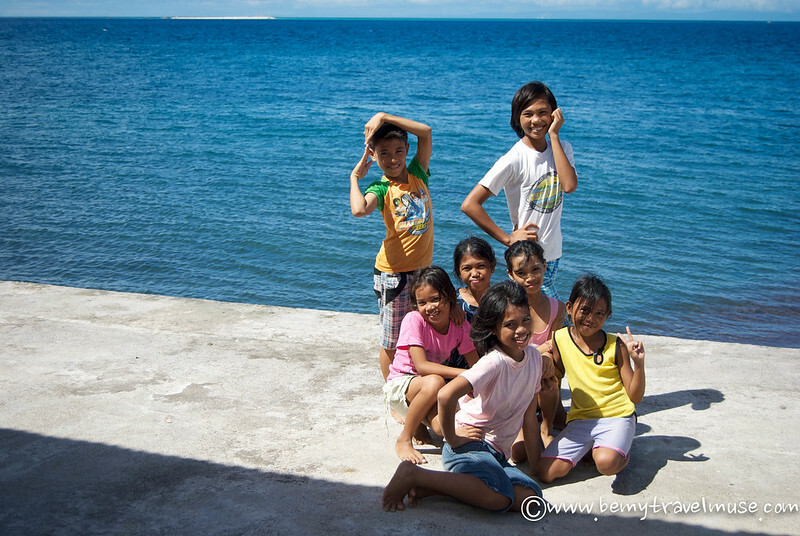 When Christmas day rolled around, the bungalow I stayed at was suddenly open with life, including a gang of incredibly friendly and adorable kids who asked if they could hang out with me. They asked me questions all about my family and what it’s like where I’m from, posed for pictures, played with my camera and took some great ones themselves, and made me feel incredibly at home. Thanks so much guys, you’re beautiful. 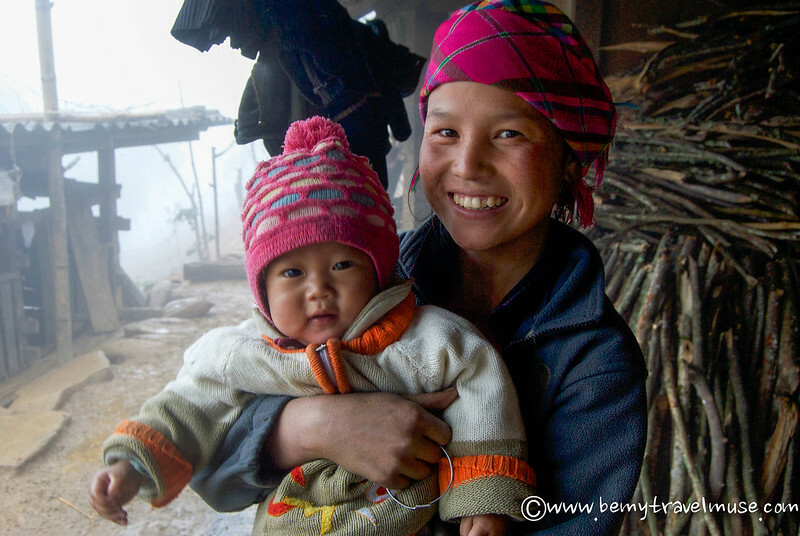 My last night in Vietnam was spent in the home of this Hmong woman in Sapa on Valentine’s Day. Cuddled up with 15 new friends I’d made in the days prior, sleeping like sardines in the loft of the drafty house, it was the closest I’ve come to living, just for a day, how most of the world lives. There were no floors, no heaters, and some homes didn’t even have doors. What they do have is amazing beauty – both the people and the landscape. Straddling the border of Yunnan and Sichuan provinces in China is Lugu Lake, a place generally populated by minority tribes from Tibet. When this man saw me stopping on my bicycle to take photos, he came over to say hello. I have since forgotten what we discussed, but remember his surprise and delight when I wanted to take a photo of him. China is confusing and frustrating for a lot of tourists due to the language barrier and extremely different culture to what most of us are used to. However, my time there, spent mostly amongst locals and hitchhiking solo through the country is one of the most rewarding and daring adventures I’ve had yet. The incredible hospitality will came back to my mind every time I think of China. 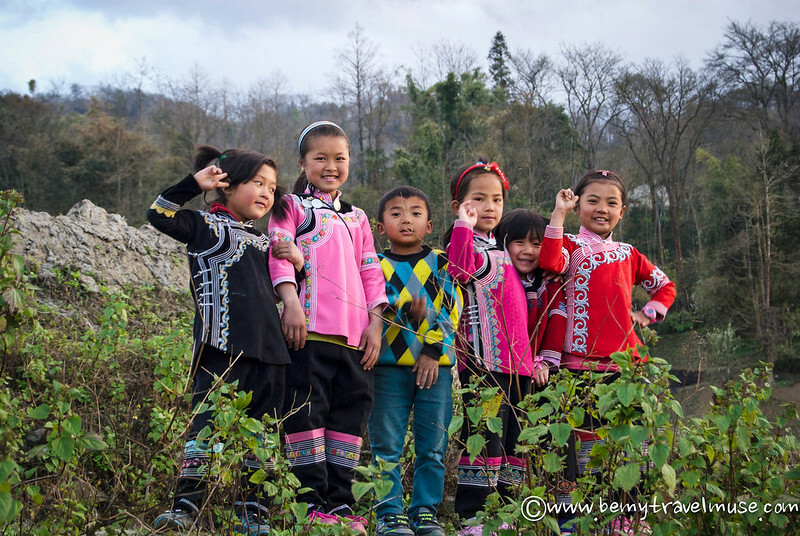 Just north of the border with Vietnam sits Xin Jia Jie, land of the Hmong tribe who have built those famous endless rice terraces by hand and water buffalo over thousands of years. As I was photographing a particularly stunning sunset these kids ran by in their everyday attire – truly, this is not special occasion clothing – and agreed when I asked if I could take a photo of them. I love the style of the women here – always decked out in bright colors and patterns. Hmong women have some seriously wicked style! 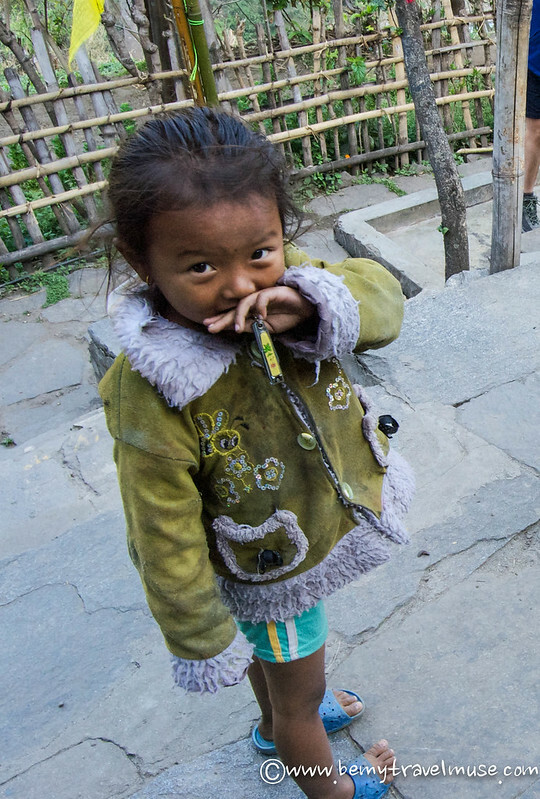 The first stop on my trek on the Annapurna Circuit in Nepal was decided when, upon entering the tiny mountainside town of Ghermu, a little girl held out her hand to offer the two I was walking with and me some sea buckthorn berries as we passed by. Next a goat came by and bowed its head for petting, and a farmer smiled and waved. It was so friendly and felt so welcoming that it’s still fresh in my mind as a highlight of Nepal – a country full of beautiful, kind, and resilient people. While in Cintsa, South Africa on the Wild Coast, I visited the smallest township in South Africa. During apartheid, townships were forced settlements for black and colored (a non derogatory term for people of mixed race) citizens. These days, many people still live in townships without running water or electricity. The backpackers I visited in Cintsa has brought solar-powered mobile computer unit to the local school there, and while I checked it out, a few local kids came over to play. I handed my camera to one and this is my favorite photo she took – this little boy kept grabbing at the lens, either wanting a turn or unsure of how the camera worked. His perplexed expression only half makes this picture. It’s those deep eyes I can’t get enough of. The friendliness of Malawians is legendary. 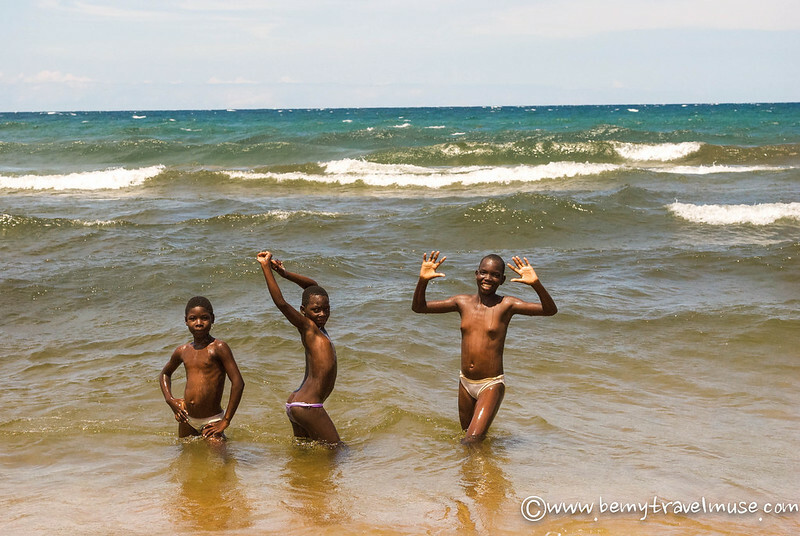 During my stay on the giant Lake Malawi, I experienced this first-hand when local people would walk along the beach with me, or enthusiastically ask me to take their photo. They ask because they have no access to cameras or photo printers themselves. For them, their chance of having a photo to remember their younger selves by hinges on asking tourists who might take a photo and mail a print of it back. It was heartbreakingly beautiful. Over the past three years I’ve learned that the world is fundamentally full of kind souls, and I’ll never let negative news article tell me any differently. People in far-off places will be endeared to me, they will not seem strange or different. Though there is undeniably evil in the world, I’ll remember that the vast majority of people are good, kind, and giving. When I pause and appreciate these memories, I stop feeling like anything is missing or in some way not whole. This is because of them. They all gave a part of themselves to me to take on the journey and by lamenting this lifestyle I indirectly undervalue them. I pledge not to do that anymore. Thank you to the people who I will probably never see again, who took it upon themselves to make me smile, to show me the way when I was lost, to pick me up when I was down, and to fill me up when I was empty. That closing paragraph… I really needed to read that today. Thank you. These are beautiful photographs, it makes me so happy to see so much happiness! 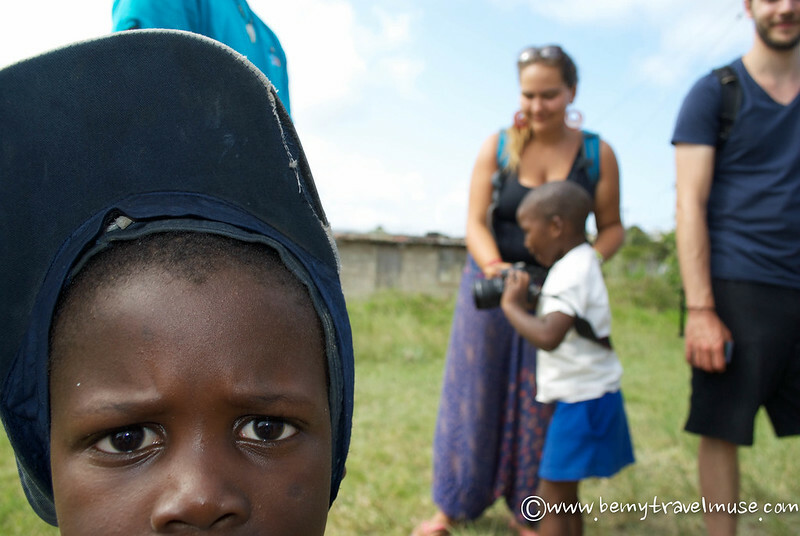 Especially love that South African kid’s eyes. His eyes are so intense and deep. Just a second earlier he was running around laughing but to see him pause for a moment of concentration so close up was pretty cool to see when I went back through the photos. This post made me smile! These are beautiful photos and I love the heart warming stories that accompany them. Glad to have made you smile! Thank you so much, Clay. I was feeling down and realized that I have been shown so much kindness and generosity during my travels, I need to remember all of these people when I feel lonely. From Abbey’s quote at the top, to your exquisite photographs, to your expressive and moving prose… the art in this far reaching post reached out and took hold of me. I am re-inspired. Not to do what you do, exactly, but to keep plodding my own course and reaching just beyond my grasp. That is where the magic happens. Well done! I truly got what I was looking for on this post. thanks, Mark. Wow, Mark, that’s an incredible comment and completely made my day. Inspiring others is what I try to do with each post and to have that kind of positive feedback is so encouraging. Yes, there are a lot of travel blogs out there but many good ones. Thanks for considering me one of them. I’m thankful for your readership. I love this photo set! Makes us realize that happiness is infectious, no matter where we’re from. Thank you for sharing these! Yes happiness exists everywhere! Kindness as well, quite often from children, I found. Glad you liked them! Wow I smiled so much reading this and looking at your incredible pictures. It made me think about all of the people I’ve met around the world who have done the same for me. I only wish I had the photos like you have. I’m always afraid to take pictures of people for some reason. True, they’re my personal memories of encounters I’ve had, and a landscape just doesn’t differ as much in that way. Never thought of that before and clearly I need to take more like these! Glad you found the Maldives post helpful. I loved that it wasn’t that expensive, after all. Lovely post! Can’t stop reading the last line again and again. The search for happiness is a daring and tricky business. Especially as we get older. I’m not surprised that most of these pictures are of children. I love how they see the world! I love all these photos. especially the one of china. OF COURSE the dude would be smoking. 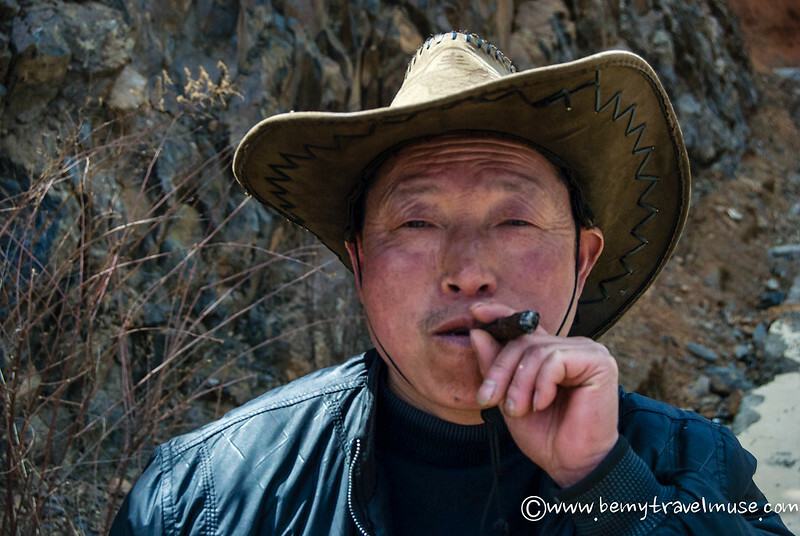 I miss china like crazy- but not the smoking! Haha yes, of course he was. There are things I miss about it too. It’s just so different and culturally diverse! absolutely beautiful. if only more people saw the world through your eyes! Aw thank you so much for the kind words, Caroline. Gorgeous, Kristin! What a sweet idea for a post. These photos make me feel so grateful. I must admit happiness is an inside game. Thanks for sharing! The themes of your posts are AWESOME! Really love this one, a gorgeous collection of happiness. To be honest, I was no intention to read your article. However, where happiness is hidden within love and kind to kids, that made me read at least made me have a great look at photos. It’s the first article I ever read on travel blog that refers love not only to partners but to all. Thank you Zascha! I loved that one too. While you thank the people that have made you smile, also remember how many people that YOU have made smile through this site! You certainly inspire me. These pictures truly show that happiness can be found in the simplest of things, so why complicate life? Those photos are so beautiful and capture such amazing pure moments. I absolutely love the Sri Lanka one. Thank you for using these photos to show solo travel and others around the world in a positive light. There’s too much hype over fear and it’s good to see more bloggers showing people how travel can be wonderful in so many ways! People in these countries may not have a lot, but they have things we don’t have in developed nations.